The picturesque parish of North Lopham lies above its neighbour South Lopham on the southern border of Norfolk, about six miles west of Diss. Lopham comes from the Old English for ‘Loppa’s homestead’. 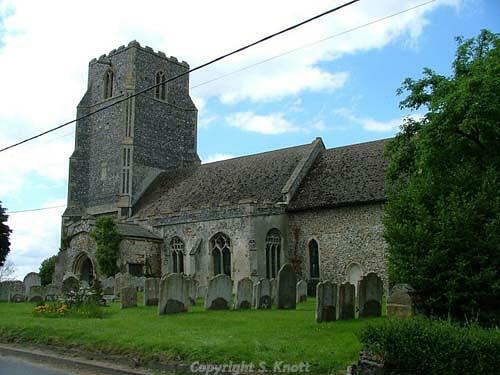 The parish has a long history and was certainly well established by the time of the Norman Conquest, its population, land ownership and productive resources (together with those of South Lopham) being detailed in the Domesday Book of 1086. The earliest dateable evidence of human activity comes in the form of part of a Neolithic stone axe hammer found in the west part of the parish in 1955 (NHER 10865), and a flint arrowhead (NHER 30954). Bronze Age finds are similarly scarce, consisting of a copper alloy axehead (NHER 30953) and part of a spearhead (NHER 30954), and the Iron Age is currently represented by just a few coins (NHER 30359 and 31177). The earliest traces of a structure recorded in the parish is a Roman villa (NHER 10870), probably consisting of two buildings. It is located to the east of the village. Ploughing and metal detecting have uncovered Roman building material, pottery, coins, quernstones and a copper alloy mount decorated with a lion's head in the vicinity of the villa. Other Roman finds include coins (NHER 16264, 18999, 30454, 30953, 30954, and 30955), brooches (NHER 16266, 18999, 30355 and 30359), the base of a pottery jar (NHER 10869) and a quernstone (NHER 10871). Although no traces of Saxon structures have been located, quite a number of objects from this period have been recovered, including coins (NHER 29894, 30359 and 31332), brooches (NHER 30359, 30454, 30743 and 31414), buckles (NHER 30359 and 30454), a finger ring (NHER 32016), a wrist clasp (NHER 30359) and a strap end (NHER 30181). The medieval period has left the parish with its oldest surviving building, St Nicholas’ Church (NHER 10884). This peaceful parish church consists of an early 14th century chancel and nave, a mid 14th century south aisle and porch and a big sturdy west tower that was built in three stages and completed in 1526. The tower retains its massive dedicatory inscription to the soul of John Caley, above which are the initials of other donors to the tower's construction. Later alterations to the building include the 19th century north vestry and all the roofs. The chancel was restored in 1862. The interior of the church is also largely Victorian, although there is a fine 14th century octagonal font with lightly cut tracery motifs, a painted Royal Arms of George III on the south aisle wall and an 18th century lead plaque on the back of the south door recording the names of churchwardens. The churchyard has some good gravestones, although there are no memorials visible in the church itself. A couple of other buildings also have medieval origins. Church House and Church Cottage (NHER 21915) are two much-altered two storey roughcast timber framed houses with pantile roofs. They were originally a single medieval hall house, to which an upper floor and a parlour block were later added. Ivydene (NHER 36313) also probably originated as a medieval hall house, though again it has been much altered since. The only other medieval feature is not actually visible; part of a medieval park (NHER 10878) near to Park Farm has been noted on old maps. Numerous medieval objects have been found, particularly by metal detecting enthusiasts. Selected examples include coins (e.g. NHER 30358, 30454 and 30953), keys (e.g. NHER 30743, 30745 and 30953), buckles (e.g. NHER 30742, 30954 and 30955), a seal matrix (NHER 30358) and an elaborately decorated sword chape (NHER 30744). Of the surviving post medieval buildings in the parish, all of which are situated along the main north-south road, probably the oldest is Trennel House (NHER 39325), a mid 16th century plastered timber framed house, much altered and extended to the south in the mid 17th century. This building has a 20th century extension to the rear. Church Farmhouse (NHER 16625), a large thatched timber framed house, is also 16th century, but from the latter part of it, and Cobblers Cottage (NHER 46404) dates to about 1600. The White House (NHER 46766) is an early 17th century rendered timber frame and colourwashed brick house with major 18th and 19th century additions and a pantile roof. Mustardpot House (NHER 41966), The Bell Pub (NHER 46225), Rosemary Cottage (NHER 46226), The King’s Head (NHER 46261), Linden House (NHER 46702) and The Thatched Cottage (NHER 46710) all date to the 18th century, while The Old Bakehouse (NHER 46227) and the former Coach House at The White House (NHER 46767), now an office, are 19th century. The Limes (NHER 16712) is a late 18th century two storey brick house with a black glazed pantile roof. The surrounding buildings, a converted timber framed barn and a weaving shed, were once a 19th century linen factory but are now much altered. The Methodist Chapel on The Street (NHER 46262) is a two storey brick and flint Methodist chapel of 1810 with later alterations. Inside is a panelled gallery on cast iron columns. Two 20th century monuments appear on the record. A World War Two pillbox (NHER 16626) guards High Common crossroads in the west of the parish, and a type K6 telephone box (NHER 46715), built to a 1935 design by Sir Giles Gilbert Scott, stands northwest of The Limes. This summary is intended very much as an overview, and those wishing to dig a little deeper should consult the detailed records. Piet Aldridge (NLA), 26 October 2006.